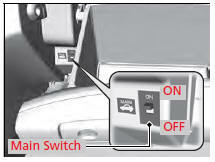 The trunk main switch disables the trunk release button on the remote transmitter and the trunk release button on the trunk lid to protect luggage in the trunk. 1. Make sure the rear seat-back is not folded down. 4. Lock the trunk release. If you need to give the key to someone else, remove the built-in key from the keyless access remote by pressing the release button, and give the remote as a valet key.